In the story “Words and Rags,” writes one editor, “Our dialect has the sounds of intimacy, the sounds of an enclosed hermetically sealed world.” In this collection of twenty-one essays, the seal to the Italian-American experience is released for readers, who are held with a sense of intimacy by the authors. The editors, both accomplished writers themselves, have compiled a moving assortment of works by Italian-American writers. Gutkind is the founding editor of the literary journal Creative Nonfiction, and an English professor at the University of Pittsburgh. Herman teaches creative writing at Manhattanville College and City College. The motivation for this collection was born at a dinner party attended by several Italian-American writers. The idea has transformed from that inception into this engrossing book. The editors do not attempt to define the Italian-American experience. The complexity of each author’s experience reveals the futility of brief definition and instead provides a rich understanding for readers, whether they are entering this culture for the first time or returning to their own memories. The collection begins with Louise De Salvo’s recollection of her grandfather, nicknamed “the drunk.” She details the heritage of drinking, the sharing of wine known as “passing the saint.” It was a habit rooted in the poverty of Italian farm workers, from whom her grandfather came. This story, like many others in the collection, hearkens back to the lifestyle and essence of Italy, but through the perceptions and manifestations of a different world. Pieces like “Sacrificio” honor the deep strength in family tradition carried from Italy. But the stories move further to explore the transformation of these traditions in a changed place. The reader feels the impact of these shifts in stories like “My Father’s Music,” in which Ned Balbo contemplates his father’s transition from playing Italian tunes on an organetto to playing popular swing songs on an accordion. Gutkind has said that the genre of creative nonfiction allows a story rooted in personal experience and truth to be transformed with literary style. The result in this collection is a display of character, sensation, and drama told with captivating sincerity in essays ripe with themes of family, gender, hardship, strength, love, jealousy, magic, and food, while revealing qualities of community, connection, and culture. These compelling stories shift as much in theme as in voice and style. The layered voices and stories are united in the Italian-American experience, but each is unique in the author’s telling. The collection does not expose a defined cultural experience, but rather a world culture that is merging and moving. 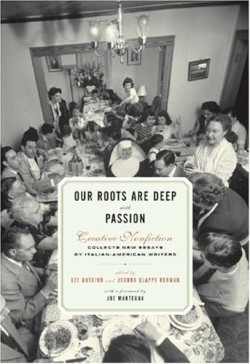 The essays are an intersection of old and new, of Italian and American. They are a dialogue with the Italian and the American, and with the hyphen between them.